Welcome back!! It is great to see you again!! Everyone LOVES your VFK adventures. Hope to talk to you soon! 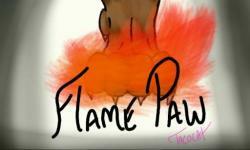 YAY welcome back flamepaw!!!!! great to see you again :) how was your Christmas? It was great! A much needed break! I should be back on VFK today! I hope to see you all soon! Just so you guys know I have not forgotten VFK! I am currently just taking a break so that I can focus on my studies I hope to return soon! Aww see you again soon! I love the pic @FlamePaw! Ditto on the pic! It's Awesome! Your avatar pictures is outstanding!!! I totally agree with sparkle! Thank you! @SkyLamb I love your picture as well! WOW @FlamePaw! I love your avatar picture, it's FABULOUS! totally matches your name! @flamepaw! TacoCat is the Official Artist of the Sleuthing Team here on the message boards and drew my profile picture; i just notified her!